The word “Licorice” actually refers to the root of Glycyrrhiza glabra, a plant which belongs to Asian and European countries. Europeans used it in tea as a cure-all concoction and later licorice became an important herb in Chinese medicinal tradition. The roots of Licorice is used for its medicinal benefits from centuries. Licorice also is known as the sweet root, mulethi (Hindi), liquirizia (Italian), regliss (French), is used as a sweetener in beverages and candies. The extracts of licorice are also used in the formation of medicines, skin ointments, beverages, and in the formation of food flavoring. The roots of Licorice is used to soothe the gastrointestinal problems. 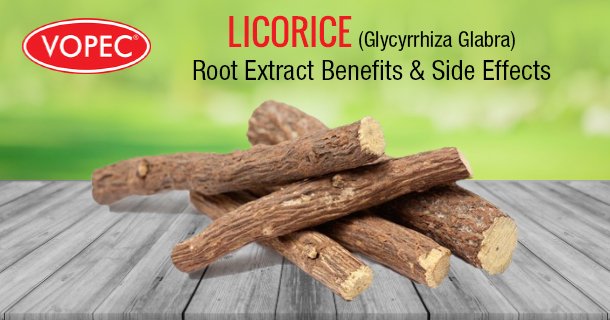 The anti-inflammatory and immune-boosting properties of glycyrrhizic acid present in the licorice root can help you recover from stomach ulcers, food poisoning or heartburn. Licorice has a beneficial effect on the liver and it increases bile secretion and lowers the cholesterol levels. Moreover, it is used as a medicinal herb for menstrual cramps, hypothyroidism, and regulating menstruation. Licorice root contains a substance which prevents the conversion of testosterone to dihydrotestosterone. Dihydrotestosterone is the substance that stimulates cell division in the male prostate gland. Licorice root may, therefore, be useful in reducing the growth of the gland and help to prevent some of the symptoms associated with benign enlargement of the prostate. Usually, for treating eczema, a topical gel containing licorice is recommended by a health practitioner. They also often suggest applying licorice to tooth decay in order to kill the bacteria. The antibacterial properties in Licorice make it an appropriate medicine for dermatological treatment. The roots of licorice are used as a herbal remedy for a cough, viral infections, sore throat, and allergic disorders. As per the Studies, almost 90% of the stomach ulcers can be healed using the Licorice extract in medicines. However, some evidence indicates that licorice only helps to speed up the healing process. As per the Studies and some pieces of evidence, some skin products that comprises of Licorice helps in reducing the bleeding after surgery. The extract of Licorice is considered to be a good option to treat regular respiratory ailments such as a cough and cold. The usage of Licorice has shown improvement in reducing Canker sores and the pain caused by them. As per studies, gargling with Deglycyrrhizinated licorice (DGL) might help in reducing Canker Sores. Indigestion (Dyspepsia) can be treated with the use of Licorice in combination with chamomile and peppermint. The extract of licorice is considered to be beneficial for losing weight and to control cholesterol; however, the dosage should be above 1000 mg a day. Do not forget to take the advice from your doctor before following these tips. It is considered that consuming 2 grams of Licorice daily for 2 – 3 months can likely aid in the treatment of Fatty Liver Disease (non-alcoholic). The extract of Licorice can also be used to treat the below-mentioned diseases. Although the extract of Licorice is safe when taken in lower amounts, it may also have a few side effects when consumed in exceptionally large amounts for more than 3 weeks. It can decrease your libido, cause frequent headaches, and lower potassium levels. You may feel weak, menstruation might not happen, and although rare, there are chances of paralysis and brain damage. You should not take licorice or licorice extract if you are already consuming the below medicines as it can interact with laxatives and can also have an effect on your heart. It is better to consult a doctor before trying out the tips or medicines mentioned. If you notice any signs of allergy from Licorice or its extract, immediately ask for medical help.